Photos from You – Look at that water! Nestled on the festival grounds of Pier Park in Panama City Beach, two local Realtors are opening a Seaside-esque Airstream (silver bullet) snack shack coming fully stocked with everything you need to keep you cool in the summer sun. With everything from packaged ice creams to sodas to funnel fries and pretzels, Big Top Treats is sure to keep you feeling super cool. Expansion is already in the plans for the future of this new addition with it to morph into a full restaurant sometime in the next year. Resurrected from the Original Miracle Strip Amusement Park, Teddy and Jenny Meeks brought an old memory factory back to life and put it center stage in Panama City Beach’s most popular place to hang, Pier Park. An original 1960’s Herschel Carousel, this ride was built to last. Swarms of people have literally come out of the wood-work to relive memories and create new ones with friends and family alike. Rides are $3 or you can get an all day pass for $5. With three locations, you can’t miss the opportunity to savor some super sweet flavored crushed ice. Notoriously overpriced, these syrup drenched cones are always worth it, and if you’re a parent, you know how much your kids just have to have one. Located across from Tootsies, close to the Starbucks and Henna tattoo place, and across from Old Navy, you can’t miss their cute little carts. What’s the difference between Italian Ice and Snow Cones you say? Well, actually not much. However, Italian Ice tends to be “shaved”, whereas Snow Cones are more ground to a snow-like texture. And, the typical flavors tend to vary. Situated in front of and ran by Popcorn Kingdom, this Italian ice stand offers fruit flavors from mango to orange to lemon and is sure to quench your thirst in our crazy humid and hot weather. Ok, so I made up the name, but the place is for real. Located right in front of As Seen on TV and Blender, Roger and his wife sell all sorts of hand-made-by-them knick knacks that would feel perfectly at home in your garden or around your home. With tons of really cute stuff from palm tree signs that rest upon wood “posts” to Tiki Signs, if you are looking for some cute beachy stuff, this is the place to go. If you are here on vacation looking for that perfect pet, pick yourself up a tiny little turtle or a hermit crab. These little guys are so cute, and come with their own little habitat for $27. I personally wish these guys were in their natural environment instead of available for purchase, but if you promise to be very nice, you can go buy one. 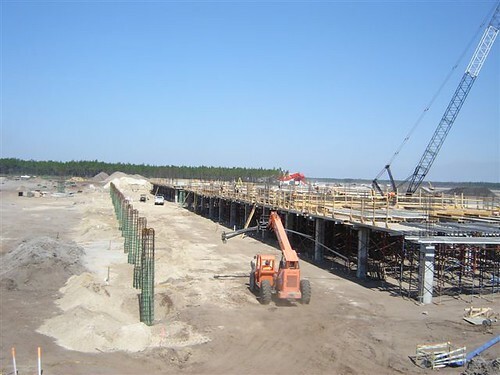 The terminal at the new Panama City Airport located in West Bay in Bay County is moving along at a swift pace. The percentage complete is just under 20% with all the pilings in place and the second floor structure being formed right now. 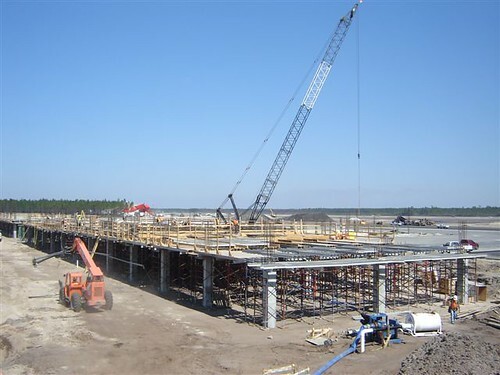 Construction of the terminal will last for the duration of the project. As droves of people waiting in weaving lines around the interior of Borders Books and Music in Pier Park, Mike Huckabee slowly made his way through “torrential” rain in his tour bus on Highway 98. Adorned with a huge image of himself, Huck’s bus sported his colors of blue and yellow. Team Huck is promoting his new book, Do the Right Thing. I haven’t actually read the book, but a review I read described that it was more of what not to do, specifically using Mitt Romney’s expensive campaign to non-nomination. Many came with their already-owned books, many others purchased the book that night. Some were supporters, others still were just there to see a previous (and possible future) presidential candidate. The buzz was great and the energy high with representatives from all the major local news stations. Mike was accompanied by two others wearing Team Huck colared shirts that resembled the uniform of a race team. The book is out, I probably won’t read it, but you can. Do the Right Thing is available at Borders Books and Music. Enjoy the pictures of the event! People on the beach at sunset as Hurricane Ike Roars past the panhandle.